So the Apple TV is now officially a high-definition device, capable of 1080p output. Still officially a hobby for Apple, but the strategy behind it is becoming increasingly clear: year after year, chip away at the dwindling reasons to subscribe to cable or satellite. Netflix and iTunes have pretty much eliminated (non-reality) TV series now, for a large segment of the population. Movies are coming along nicely, with Netflix streaming and iTunes movie rentals, along with sharing from computers and devices on your home network. The most oft-repeated reason to keep cable or satellite seems to be sports programming. It would appear that Apple has baseball, basketball, and hockey taken care of now. Football (of the American variety) is no doubt tougher (read: much more expensive), and football (of the rest-of-world variety) is likely the same story. This is hardly an insurmountable problem, though it’s not quite as easy as “just add money and stir”. Give it some more time. Maybe I’m wrong about the strategy. We shall see. But I don’t care about either kind of football, or anything else that happens on cable, so it looks like a winner to me right now. We’ll have one in the living room pretty soon. Ghost in the Pixel has a really nice list of design resources. Numerous books, articles, films, and organizations. Some great stuff in there. Go watch How to Put Yourself Inside of a Coat, a video by Allie Brosh of Hyperbole and a Half. It explains very well why I choose not to write end-user documentation. Ars Technica: Siri is iPhone 4S-only today; where will it be tomorrow? We currently interact with our computers and other devices in several different ways: direct and indirect touch, keyboards, mice, styli, voice, and more. I fail to see why people would suddenly interact solely by voice. These are Star Trek people, fer cryin’ out loud! Surely Okuda has more imagination than this. 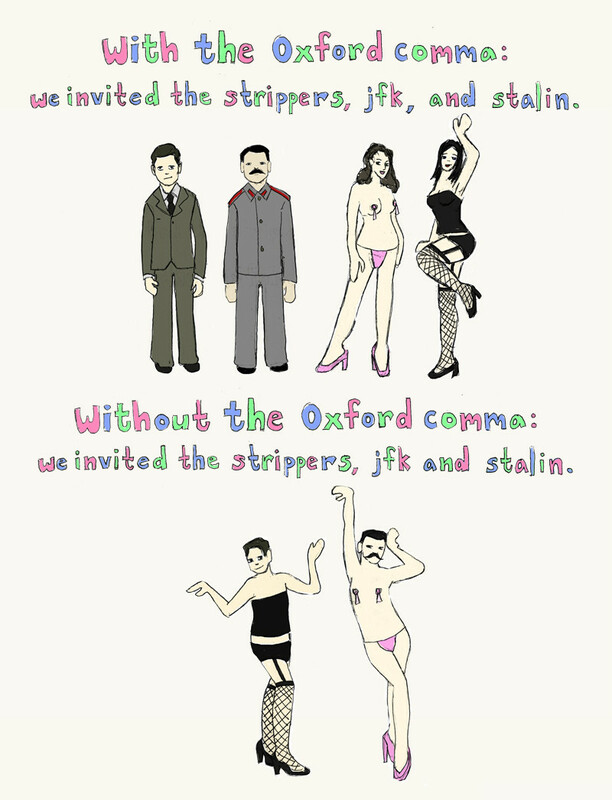 On the importance of the Oxford comma. Found here, by way of Peter Brown on the Facebooks.